I introduced a teaching tool I call ‘Card Shouting’ into some of my lectures a while ago – usually those dealing with Puzzle Based Learning or thinking techniques. What does Card Shouting do? It demonstrates probability, shows why experimental construction is important and engages your class for the rest of the lecture. So what is Card Shouting? Pause to leaf through the deck and pull out a Ace, King and Queen. Also grab a 2,3 and 4. Any suit is fine. Hold up the Ace, King and Queen. “Let’s find out what works best: praise or yelling- but we’re going to have measure our outcomes. I want to know if my training is working! If I draw a bad card and abuse it, I want to see improvement – I don’t want to see one of the bad cards on the next draw. 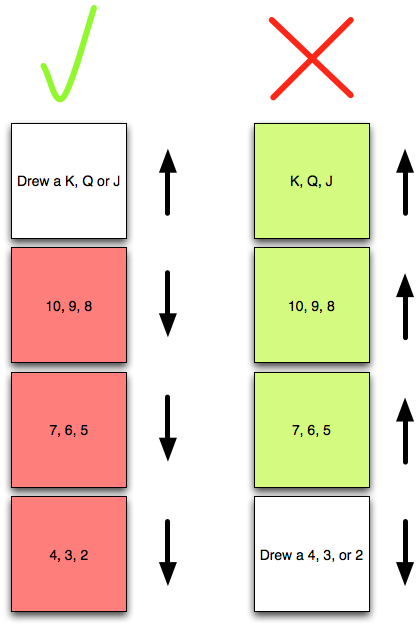 If I draw a good card, and praise it, I want the deck to give me another good card – if it’s lower than a J, I’ve wasted my praise!” Then work through with the class how you can measure positive and negative reaction from the cards – we’ve already set up the basis for this in yesterday’s post, so here’s that diagram again. In this case, we record a tick in the top left hand box if we get a good card and, after praising it, we get another good card. We put a tick in top right hand box if we draw a bad card, abuse the deck, and then get anything that is NOT a bad card. 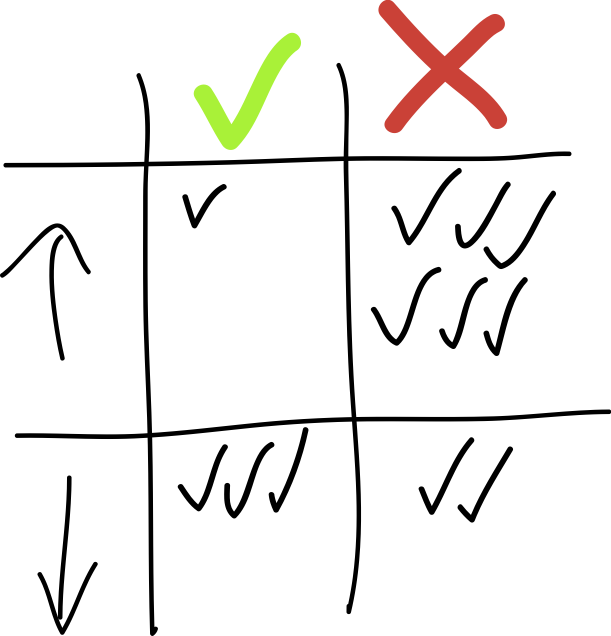 Similarly for the bottom row, if we praise it and the next card is not good, we put a mark in the bottom left hand box and, finally, if we abuse the card and the next card is still bad, we record a mark in the bottom right hand box. Now you shuffle and start drawing cards, getting the reactions and then, based on the card after the reaction, record improvement or decline in the face of praise and abuse. If you draw something that’s neither good NOR bad to start with – you can ignore it. We only care about the situation when we have drawn a good or a bad card and what the immediate next card is. The pattern should emerge relatively quickly. Your card shouting is working! If you get a card in the bad zone, you shout at it, and it’s 3 times as likely to improve. But wait, praise doesn’t do anything for these cards! You can praise a card and, again, roughly 3 times as often – it gets worse and drops out of the praise zone! Not only have we trained the deck, we’ve shown that abuse is a far more powerful training tool! What? Why is this working? I discussed this in outline yesterday when I pointed out it’s a commonly held belief that negative reinforcement is more likely to cause beneficial outcome based on observation – but I didn’t say why. Well, let’s think about the problem. First of all, to make the maths easy, I’m going to pull the Ace out of the deck. Sorry, Ace. Now I have 12 cards, 2 to K.
Well, there are 3 good card values, out of 12, and 9 card values that aren’t good – so that’s 9/12 (75%) chance that I will get a not good card after a good card. What about if I only have 12 cards? Well, if I draw a K, I now only have the Q and the J left in my good card set, compared to 9 other cards. So I have a 9/11 chance of getting a worse card! 75% chance of the next card being worse is actually the best situation. You can probably see where this is going. I have a similar chance of showing improvement after I’ve abused the deck for giving me a bad card. Shouting at the cards had no effect on the situation at all – success and failure are defined so that the chances of them occurring serially (success following success, failure following failure) are unlikely but, more subtly, we extend the definition of bad when we have a good card – and vice versa! If we draw any card from 5 to 10 normally, we don’t care about it, but if we want to stay in the good zone, then these 6 cards get added to the bad cards temporarily – we have effectively redefined our standards and made it harder to get the good result. Here’s a diagram, with colour for emphasis, to show the usually neutral outcomes are grouped with the extreme.. No wonder we get the results we do! The rules that we use have determined what our outcome MUST look like. My final post on this, tomorrow, is going to tie this all together to talk about giving students feedback, and why we have to move beyond simple definitions of positive and negative, to focus on adding constructive behaviours and reducing destructive behaviours. We’re going to talk about adding some Kings and removing some deuces. See you then.